Development and Peace has a long history of involvement in the Philippines. Its community development program is focused on land reform, agriculture and access to resources for impoverished rural and urban communities. On November 8th, 2013, the Philippines was hit by the strongest typhoon in its history: Super Typhoon Haiyan. In response, Development and Peace is helping affected communities become more resilient and participate directly in the reconstruction process. Drawing on the expertise of its existing partners, Development and Peace is addressing the poverty, socio-economic inequality and state of powerlessness that makes poor and marginalized communities so vulnerable to natural disasters. “It is such a blessing from God to have my own boat. What I give of my catch is such a small compared to what we have been given.” Rodel Doble, a fisherman who received aid from Development and Peace and Caritas Philippines – NASSA after Super Typhoon Haiyan. This program recognizes the fundamental importance of accountability to, and the democratic participation of, affected populations. It transforms the generosity and solidarity of Canadians into a lasting contribution towards improved living conditions and a better future for those most affected. Read about Development and Peace’s approach to reconstruction in this report by Jess Agustin, Program Officer for the Philippines. The Philippines has a population of close to a 100 million. Decades of poor governance has denied the population access to basic amenities and corruption continues to be barrier to development that responds to the needs of all. The country has vast mineral wealth, however, a 1995 mining bill opened the sector to foreign investment, which has caused the proliferation of open-pit mining to the detriment of the environment and with little benefit to local populations, including a large percentage of indigenous communities. Despite the majority of the population living from subsistence farming, most land is concentrated in the hands of a few. There have been various attempts to reform this inequality, however, it has been a long process where small-scale farmers have not always received the support they need to gain access to land or make their crops profitable. In addition to these multiple socio-economic challenges, the Philippines is prone to natural disasters, such as earthquakes and typhoons. The effects of these are exacerbated by poverty and environmental degradation. In recent years, the strength and frequency of these storms has augmented due to climate change. On November 8, 2013, the Philippines was struck by the worst natural disaster in its history when Super Typhoon Haiyan (known locally as Yolanda) tore through the centre of the country. The storm reached wind speeds of up to 348 km per hour and made landfall six times, destroying nearly everything in its wake. According to the United Nations, 14 million people were affected by the disaster. The islands of Leyte and Samar were the hardest hit, and the whole region of the Visayas was severely damaged. It has already been three years since Super Typhoon Haiyan (known locally as Yolanda) ripped through the Visayas in the Philippines, yet reports show that only 1% of houses promised by the government have been built. The local elementary school in the community of Diit is a beehive of activity these days. Development and Peace understands the importance of strong communities. When communities are united, cohesive and organized, they have to power to improve their living conditions and to be more resilient in the face of natural disasters. It is hard to imagine that a hilly piece of land on the outskirts of the seaside city of Tacloban in the Philippines will soon be transformed into a bustling village with a population of about 3,000 people. But this is exactly what will take place over the next few months as construction of the Pope Francis Village begins. One year ago, we met Ramon Apit. His community in Barangay 86 was completely torn apart by Typhoon Haiyan in November 2013. As part of the International People’s Conference on Mining, I had the chance to participate in a solidarity visit to the city of Mankayan in the Province of Benguet in the Philippines. From July 30th to August 1st, the International People’s Conference on Mining (www.peoplesminingconf.net) took place in Quezon City, the Philippines. When Super Typhoon Haiyan laid waste to the fishing communities that lie along the banks of San Pablo Bay in the city of Tacloban, few imagined that a rebirth could rise out of such complete devastation. At the first hint of a cool breeze from the setting sun, a buzz of activity takes over a small plot of land that faces the sea in the city of Tacloban in the Philippines. The garden is soon full of women and children toiling away under the pinkish hue of the sky – the sign that it is finally cool enough to till the earth, pull up weeds, and tend to the vegetables sprouting from the ground. The world just marked the anniversaries of three of the most devastating natural disasters to happen in recent history: the 2005 Indian Ocean tsunami; the 2010 earthquake in Haiti; and the 2013 typhoon in the Philippines. On his recent visit to the Philippines, Pope Francis spent a day in Tacloban meeting with survivors of Typhoon Haiyan. While there, he was hosted by the Archdiocese of Palo, whose Social Action Centre is one of Development and Peace’s main partners in its response to Typhoon Haiyan in the area. Barely one year after the devastation of Typhoon Haiyan, the Philippines has had to brace itself for the arrival of another typhoon. When Typhoon Haiyan tore through the Philippines, it not only destroyed people’s houses and swept away their belongings, for many, it also took away their ability to make a living. The tiny community of Baranguay 86 in the city of Tacloban is barely visible. Hidden behind an overgrowth of bush, a small muddy path leads to a cluster of dwellings pieced together like a patchwork quilt. The community, like most in the city of Tacloban, was severely hit by Typhoon Haiyan (known locally as Yolanda). Mr. Sopriano Barsana, a retired policeman on the island of Samar in the Philippines, stands in front of his house – or what used to be his house. All that remains is one standing beam and a concrete floor littered with pieces of rusted tin, chunks of cement bricks in various stages of disintegration and brambles of metal wire. The impact of Super Typhoon Haiyan on the most poor and vulnerable was devastating. Many lost everything without the means to rebuild. One year later, are their lives improving, or are they more at risk of being further marginalized and left out of a reconstruction process that will leave them further impoverished. A race to the end in the Philippines! Just when I thought my Development and Peace Amazing Race had become a bit routine we hit a road block! After a long flight from Canada, our Development and Peace delegation arrived in Manila around midnight, Saturday, August 15, 2014. We were tired but excited to begin our visit with our partners in the Philippines, particularly those responding to Typhoon Haiyan. The fierceness of Typhoon Haiyan can be easily seen from the road that winds along the coast of Eastern Samar (Philippines). Every few hundred metres, out of the billowing coconut trees, another town of ramshackle houses appears, the tarps that serve as roofs flapping in the wind. With so much devastation around, it is easy to lose sight of what is beyond the palm trees. Arthur Peters is the Executive Director of ShareLife of the Archdiocese of Toronto. He is part of a delegation visiting Development and Peace projects in response to Typhoon Haiyan (Yolanda) in the Philippines. It’s been nine months since Typhoon Haiyan (known locally as Yolanda) barrelled through the Philippines, yet evidence of its gale force winds and crushing waves are still very visible all around the city of Tacloban, one of the worst-hit areas. Although debris has been cleared from the roads, at times it feels as if it has simply been pushed to the side. 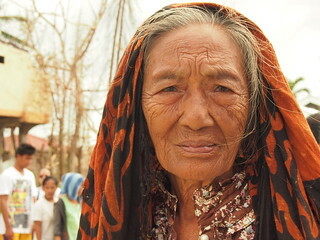 Fran Lucas, of the Catholic Women’s League, is a member of the Development and Peace delegation visiting Typhoon Haiyan-affected communities in the Philippines. A delegation representing several Catholic groups in Canada is travelling to the Philippines, by invitation of Development and Peace, to visit communities affected by super Typhoon Haiyan in November 2013. There comes a time in most journeys when the mind and heart make the switch over from focussing on the travel and adventure to thinking about returning home. Yesterday was that day for us. For our last full day in the Philippines, we put ourselves in the hands of our partner, PETA (Philippines Educational Theatre Association). Today, we travelled to Caisawan in the province of Eastern Samar to actively participate in the Typhoon Haiyan (known locally as Yolanda) Shelter Recovery Program. A group of twelve Development and Peace members from the Prairies and the Atlantic provinces, accompanied by two staff members, are on a solidarity trip to the Philippines. Development and Peace has raised over $10 million to provide humanitarian aid to communities in the Philippines that were impacted by super Typhoon Haiyan, which left an estimated 14 million people in need of some form of assistance due to the storm’s impact. Development and Peace has increased support to relief efforts in the Philippines thanks to the outpouring of generosity from across the country in response to Typhoon Haiyan. “Tacloban and the island of Leyte have received wide media coverage, but Panay Island mustn’t be forgotten,” said Father Mark Granflor, director of the Social Action Centre of the archdiocese of Capiz (the diocesan Caritas office). “Here too, families have been very badly hit and people are suffering. The city of Tacloban, one of the areas that suffered the worst devastation from Typhoon Haiyan, received some relief when the Caritas network delivered 500 tarpaulins to those left without shelter after the storm. The tarps were transported by the Australian Air Force, who took the Caritas cargo from Cebu, the main hub of relief efforts, to Tacloban, on a C-130 Hercules. “Solidarity is important to the Philippines,” said Trixie Suarez, headmistress of the Singapore School on Cebu, one of the islands badly damaged by Typhoon Haiyan. “Our students and teachers organized a fundraiser so that in partnership with Caritas we can help people affected by this natural disaster,” she said. There is devastation everywhere and the victims are in desperate need of everything,” said Fr. Edwin Gariguez, Executive Secretary of Caritas Philippines-NASSA, after visiting destroyed villages in the province of Leyte, one of the hardest hit areas by Typhoon Haiyan. The Philippines was struck by the worst disaster in its history on Friday, when super Typhoon Haiyan (known locally as Yolanda) ripped through the country. Just a mere few weeks after a violent earthquake struck the island of Bohol in the Philippines, the country is experiencing one of the worst typhoons in its history. The Philippines: Is consent too much to ask? Over thirty people have crammed into a small wooden hut surrounded by mountains and rice paddies in the village of Bayog. Inside, a lively debate is raging. “When the company put the monuments to demarcate the land of the mine, some of our land was included inside, but we don’t want our lands to be inside,” states someone in the hut. A violent earthquake measuring 7.2 on the Richter Scale shook Bohol Island in the Philippines on October 15, 2013. The quake and its numerous aftershocks struck the central region of Visayas, killing nearly 200 people and affecting over three million more. The most impacted regions remain very difficult to reach for those attempting to provide humanitarian assistance. Timuay Boy Anoy, a tribal leader of the indigenous Subanens of the Philippines, knows all too well the conflicts that come with a mine. When the Filipino Government handed over Subanen ancestral lands as a concession to a Canadian mining company, the community quickly dissolved into factions of those in favour of the mine and those opposed. In August 2012, Typhoon Saola (also referred to as Gener) and torrential rains caused extensive damage in the northern Philippines, particularly in the capital Manila and its surrounding areas. Typhoon Bopha (known locally as "Pablo") passed to the south of the large islands of the Palau archipelago on December 3, on its way to the Philippines, with winds recorded at over 250 km per hour. The human toll has been catastrophic and continues to rise with every passing day. The number of dead has risen to 500 people and 400 others are still missing. Development and Peace is supporting local organizations in the Philippines to bring aid to flood victims there. Heavy rains in the capital Manila and surrounding areas have submerged entire communities, causing the death of over 100 people and the displacement of close to 3 million people. Development and Peace congratulates Father Edwin Gariguez, Executive Secretary of CBCP-NASSA/Caritas Philippines, on being honoured with the Goldman Prize for his outstanding efforts to protect the environment. For a week during Lent I had the great privilege of accompanying Father Edwin Gariguez through a solidarity visit of the Atlantic Provinces. Father Edu is executive director of NASSA, the social action arm of the Philippines Catholic church and one of Development and Peace’s most enduring partners. It was with these words that Michael Casey, Executive Director of Development and Peace, opened a meeting yesterday with two representatives of the Federation of Filipino-Canadian Associations of Quebec (FFCA). Agrarian land reform has been a hard struggle in the Philippines. At a certain time, it was estimated that 10% of the population controlled 90% of the land. A land redistribution program was put in place to try to create a fairer reality. Although this reform has been ongoing for two decades, it has been a long and slow process. Development and Peace is committing $50,000 towards humanitarian aid in the southern island of Mindanao in the Philippines, which was hit by flash floods and landslides triggered by Tropical Storm Washi on December 17th and 18th. Flash floods triggered by Tropical Storm Washi in the southern region of the Philippines has claimed the lives of close to one thousand people, mostly women and children, and the government of the Philippines has declared the situation a national calamity.